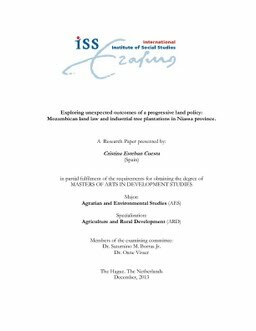 Erasmus University Thesis Repository: Exploring unexpected outcomes of a progressive land policy: Mozambican land law and industrial tree plantations in Niassa province. Exploring unexpected outcomes of a progressive land policy: Mozambican land law and industrial tree plantations in Niassa province. This paper seeks to problematize the role of the state and the ‘formal and informal bundle of powers exercised by different actors’ (Wolford et al. 2013) within the outcomes of the implementation of a progressive land policy. The study attempts to provide an empirical base to apply some theoretical concepts to the processes of land grabbing. The paper has illustrated to what extent and how a progressive land policy can protect people from the impacts of the land grabbing phenomena in three steps. First, it has explored the features of the Mozambican land law. Second, the political economy and political ecology of the problematic have been illustrated with the outcomes of a land grabbing case for industrial tree plantations. Third, the balance of powers among the different parties involved in the process has been discussed. Finally it has been concluded that a legal mechanism to protect land rights like a law, cannot shield people from the current of capital accumulation by itself. The power exercised by the state and the other actors involved in the process of a land law implementation are relevant as well.